The Edmonton communities of North Glenora, Millbourne and Westwood will see new affordable housing projects from the Right at Home Housing Society in partnership with the Government of Alberta. The province is investing $6 million to support the three innovative new developments. 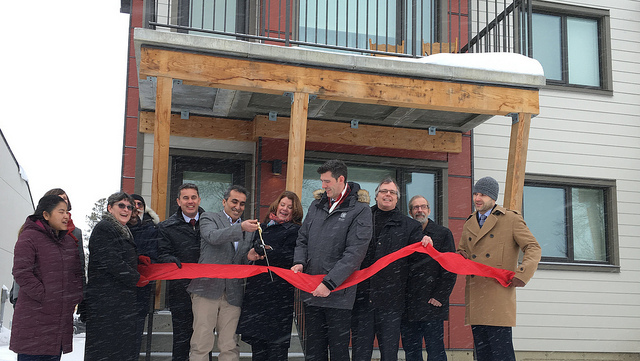 Minister Lori Sigurdson, mayor Don Iveson and new residents and supporters of North Glenora Townhomes affordable housing cut a ribbon at the official grand opening of the new units. North Glenora Townhomes is the first project to complete construction. Minister of Seniors and Housing Lori Sigurdson cut the ribbon to officially open the complex. The development transformed an aging church into 16 net zero housing units for families. This means the townhomes generate about as much renewable energy as they consume, resulting in a lower carbon footprint as well as decreased energy bills. Construction is set to begin this spring on the Millbourne and Westwood affordable housing facilities. Families are expected to move in September 2019.